Antwerp – The stabbing of a Belgian Jew in the neck on Saturday has led to increased calls for action against rising anti-Semitism in Europe, as the local community seeks answers for how to protect itself. The thirty-one-year old ultra-orthodox victim was attacked while walking on an Antwerp street and was subsequently released home after being treated. Belgian Jewish leaders are currently looking at security precautions put in place following a shooting attack in Brussels’ Jewish museum in May which left four dead. Rafael Werner, head of the Flemish Forum of Jewish Organizations, said that it was “still not clear what the real reason [for the attack was but] it’s most probably antisemitic” and that the community is “working very hard on security” and looking at what precautions it have missed. “Every incident increases the fear,” felt by the community he said, adding that local Jews were happy that the victim has already returned home. Following May’s attack, representatives of the local community were pugnacious, stating that they refused to allow themselves to live in fear. A study commissioned by the European Union Fundamental Rights Agency last year, however, painted a different picture, finding that almost a third were mulling emigration as a response to heightened anti-Jewish sentiment. Rates of anti-Semitic incidents rose precipitously this summer during Israel’s invasion of Gaza, prompting European Jewish Congress head Moshe Kantor to prognosticate that Jewish life on the continent would become “unsustainable” without a reduction in the climate of fear. A joint statement by the foreign ministers of Germany, France and Italy this summer decrying anti-Semitism and statements like German Chancellor Angela Merkel’s, in which she asserted that it was her “national and civic duty to combat anti-Semitism,” have given some Jews cause for hope, but not everybody is convinced. “Frankly, it is deeply concerning that even as anti-Semitism is rising in Europe, a third fewer countries are participating in the 2014 conference than took part in the 2004 conference,” US ambassador to the UN Samantha Power said at a gathering of the Organization for Security and Cooperation in Europe at which the issue was discussed last week. Both the Anti-Defamation League and European Jewish communities have previously criticized European efforts to monitor anti-Semitism and some groups have called for the creation of a European equivalent of the office of the American Special Envoy to Monitor and Combat Anti-Semitism. 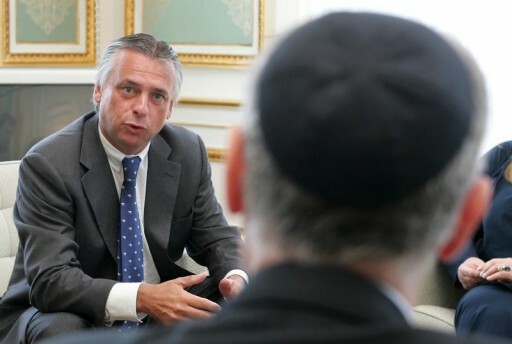 In Israel, Knesset Immigration, Absorption and Diaspora Committee chairman Yoel Razvozov (Yesh Atid) wrote to Belgian Ambassador to Israel John Cornet d’Elzius Saturday night, stating that Jewish blood cannot continue to flow in the streets of Belgium. “I am convinced that there is increased security around Jewish institutions in Belgium, but once again there was a serious act of violence against a Jew in Belgium,” the Yesh Atid MK wrote. “A situation in which a rabbi is attacked on Saturday afternoon as he leaves synagogue is unacceptable.” Razvozov wrote that the ease in which a passer-by could draw a knife and slit a Jewish mans’ throat shows how fragile Belgian Jewry’s safety is. “This event, whether it was planned of improvised, should light a very large warning light. It cannot be that in a matter of a few months, Jews blood is flowing in the streets of Belgium again,” he added. The Belgian government must act strongly against those who attack Jews, Razvozov demanded, calling for it to continue its agenda of fighting anti-Semitism.